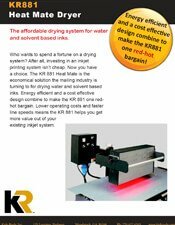 The KR881 infrared inkjet dryer is an affordable, high efficiency ir drying system used with water and solvent based inkjet printing systems. 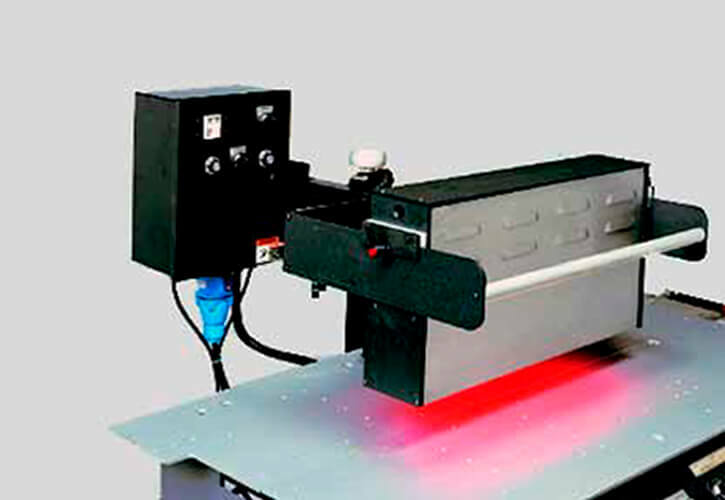 Specially designed bulbs reduce glare and direct most infrared energy towards the ink pattern. This means the dryer operates at a lower power setting, limiting energy consumption and extending bulb life. Transport base connections ensure dryer only operates when the base is running while a circuit board provides line speed information eliminating the need for a tachometer. The KR881 is available in two sizes: 10″ and 16″. The 10″ unit outputs a maximum of 3 kw. The 16″ unit is available in four power levels: 3.2 kw, 4.8 kw, 6 kw and 9 kw. All systems operate on 240VAC. Automatic temperature control is based on line speed. Dryer output automatically adjusts for speed changes.